Make your next corporate or private event a big win for your whole team. San Francisco’s only Arcade/Sports Grill to your company or group. Players can accommodate groups and events from 10-454 guests. Players is open seven days a week for lunch, brunch, dinner appetizers, and drinks. We offer a unique atmosphere with spectacular views of San Francisco Bay in a casual and memorable setting. Our Sports Grill, Patio, Arcade, Club Room, and Luau Lounge can be rented together or separately, the choice is yours. Check out our Birthday Packages for kids 18 and under, or choose one of our group menus for your upcoming event. 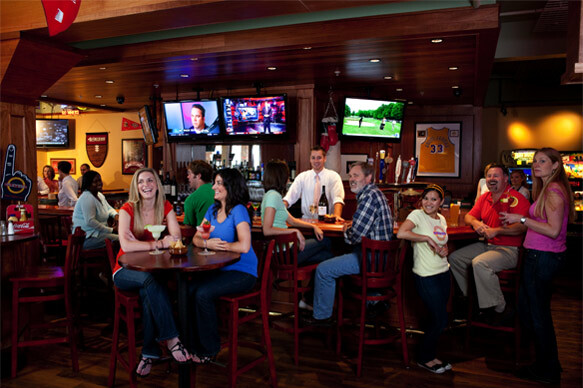 Located in the front of Players, our Sports Grill boasts eight 48” flat panel HD TVs, and a friendly mahogany wood bar. It accommodates up to 24 people seated at the Bar, 41 seated at the tables and up to another 30 people standing. The sports décor that adorns the walls and ceiling are sure to get your guests pumped for the main event. With 200+ sports channels, you can treat your guests to virtually any sports event you choose. Head on down to the Luau Lounge and Tiki Bar at Players Sports Bar for a taste of the tropics and get your hula on. Make it a fun party for the office crowd or an escape with the family. Luxuriate with your favorite fruity cocktail that reminds you of the islands with the best waterfront view that San Francisco has to offer. 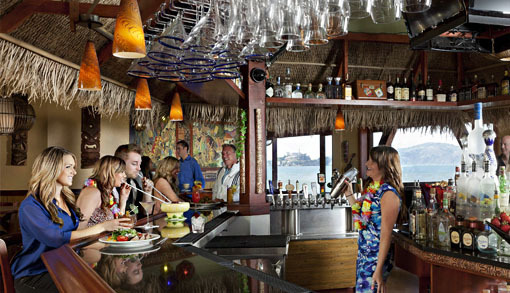 Located at the very end of PIER 39, the Luau Lounge offers unobstructed views of San Francisco Bay so close to the water that when the America’s Cup boats race past you’ll practically feel them. This is the BEST place to watch world-class sailboat racing - up close and personal! Located between the Sports Gill and the Arcade, the Club House features four 48” flat panel HD TV’s and is the perfect space for guests who can’t pry themselves away from the game while enjoying their favorite sports grill items like Philly Cheese Steaks, Burgers, Garlic Fries, and more. The Club House accommodates up to 35 people seated and 54 people standing. With over 85 arcade games, two billiard tables, air hockey, and more, our Arcade offers a great place for your guests to let loose. From classics like Skeeball to new favorites like Deal or No Deal, NFL 2 Minute Drill, NBA Hoops, Wheel of Fortune, Dance Dance Revolution, Old West Shooting Gallery and more, there’s a game for everyone of all skill levels. Our 6,000 square foot Arcade accommodates up to 250 people standing. Located outside and in front of Players, our relaxing Patio offers guests the best of both worlds: three 48” HD TV’s, all their pub favorites and weather permitting, the joy of being outside. The Patio accommodates up to 25 people seated. Cancellation policies are: minimum 30 days notice – full refund of deposit; Less than 30 days prior to the event – 50% of deposit to be refunded; Less than 14 days prior to the event – the deposit shall be forfeited in its entirety. The above stated party will be responsible for extra supplies/expenses necessary to host event, and any additional expenses incurred to operate the event. The above stated party will be responsible for any and all lost and/or damaged equipment, product, or property caused by guests or attendees, or other improprieties while utilizing the property. Copyright © 2012, Peak Attractions, LLC. All rights reserved.